Every now and then I like to do something different in the way of posting something not focused on stem cells. I don’t have much time outside of my job as a stem cell scientist and educator to do stuff, but one of my hobbies is gardening. This year I am trying to grow giant pumpkins. I’ve grown pumpkins in the past, but never with the goal of getting a super big one. The largest one I’ve grown was probably 10 years ago and weighed about 75 pounds. Someone asked me why anyone would grow big pumpkins? My answer was for the fun of it. I’m sure stem cells are in there doing something, right? Maybe I should market a product “Giant Pumpkin Stem Cell Muscle Growth Cream”. Giant pumpkins are not grown to be eaten as pies or otherwise. It is small pumpkins that have more sugar and are good to eat. 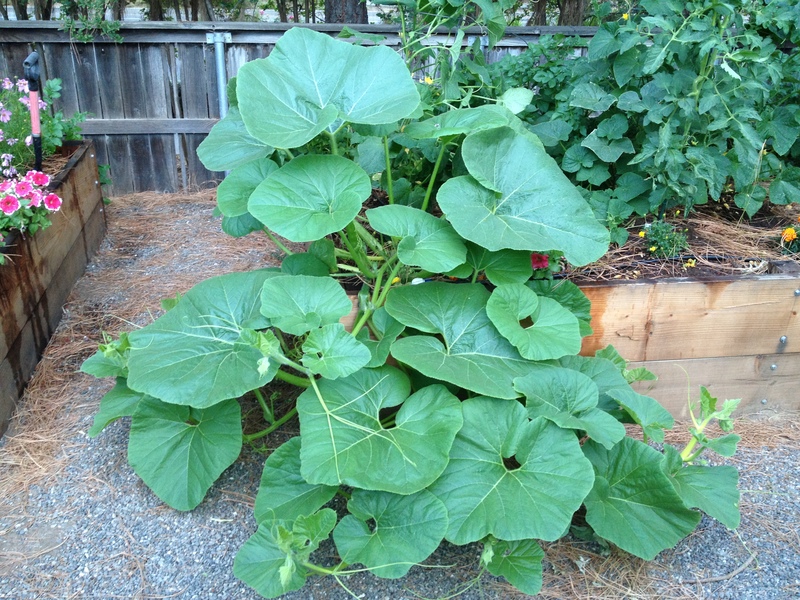 I started by planting two Atlantic Giant pumpkin seedlings in my garden in May. Here in Davis, CA it is already warm that month and the plants took off. I could literally see them grow day by day, sometimes several inches per day. After about one month they were huge and had leaves the size of a small elephant’s ear. See image above from early June. I would estimate that after that point the plant vines grew about a foot a week in length. It is remarkable. About a week after the above photo was taken, the second of the two plants set a fruit. In other words, a female flower got pollinated and a small yellowish pumpkin starting growing. Now three or so weeks later this pumpkin is already larger than any pumpkin I’ve grown all the way to maturity in October before as a gardener in past years and it is only the first half of July. I estimate it weighed 85 pounds as of early July and there is still about 3 months of potential growth left if it doesn’t poop out. See image at right of the pumpkin next to my shoe. I will periodically give updates on how this pumpkin and any others that form are doing. I’m not an expert at giant pumpkin growing, but I can already give some tips just based on experience. Obviously you need to start with good seeds or seedlings from giant pumpkin parents. I started this year with seedlings of Atlantic Giant as I said, but ideally I should have planted the seeds directly myself. I got the seedlings at Ace Hardware here in Davis. Your soil should be rich and you need to water frequently. How often depends on weather. Here in Davis, CA it is very hot and dry so I water the pumpkins 3 times a week (whereas for example I only water my tomato plants once or at most twice a week). If you want a really huge pumpkin only let each plant make one pumpkin. As tempting as it is to get more pumpkins, if the plant puts all its energy into only one pumpkin the results are sure to be more dramatic. The plant that has the pumpkin shove above growing on it has two many 10+ foot long vines and could easily have 5-10 pumpkins, but I only let it keep one. Up until last week I did not fertilize the pumpkin plants at all, but I did add a 5-15-5 fertilizer this past weekend to encourage more flowering and fruit growth. Yes, pumpkins are fruits, not vegetables. We’ll see if the fertilizer makes any difference. We had a week of 105+ degree weather at the end of June into early July and it took a bit of a toll on the pumpkin plants. Some leaves got sunburned on the edges, which turn dry and crumbly, but overall they held up pretty well. Now that the weather is “only” in the 90s, more normal for here, the plants have perked up again. Put something under your pumpkin. One of my kids helped me slide a thick piece of cardboard under ours to protect the bottom. Let’s see how the pumpkin grows the rest of the summer.